Dave says: "The car is a little bigger than the actual plan, as it is based on 16mm to the foot scale (around 1:19). I don't count rivets and if it looks about right, then that's fine by me. It was built using scrap materials (except for the trucks). I even cut out the brake wheels from 1/16" ply using a sharp craft knife. Wire came from the hangers provided by the dry cleaners.The bulk of material came from the plywood skin of an interior door that we replaced. I don't have access to a saw table or band saw, so all was cut using hand tools . I have detailed the interior loosely following plan #58-C. So you see you can produce something with very little cost . . . just time "
Dave says: "This is an extended version of the 26 ft Combine. Unfortunately we can not get scribed siding in the UK, so it was built from local DIY-shop materials. 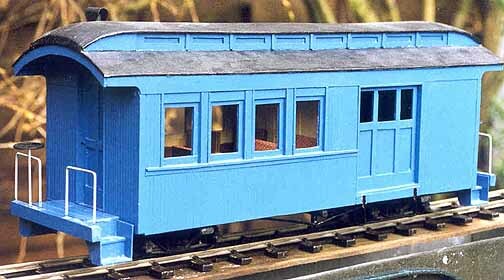 The trucks are LGB with Bachmann wheels. 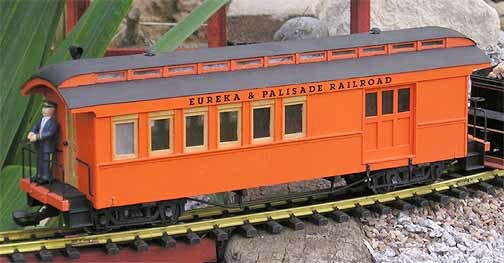 "The colour is all wrong ( as I recently found out ), but I could find very little information on Eureka & Palisade rolling stock."